Sublimation ink, which is commonly known as heat transfer ink is a type of printer ink. The sublimation ink consists of a carrier and sublimation disperse-dye. The carrier may include water or oil or other solvents, and some additional chemical ingredient. The sublimation ink is used with professional quality inkjet printers for sublimation printing applications, where images are printed on the transfer paper using the ink and the printer, which is then transferred to substrates like mugs, T-shirts, etc with the help of a heat press machine. Applications of Sublimation printing are very wide, particularly in the domestic heat sublimation technology, rapid environmental development, clothing, decoration, printing and dyeing, gifts, advertising, light industry, art, tourism, photography, building materials and many other industrial production purposes. Savvy business owners have been taking advantage of the versatility of sublimation ink since very long. It’s not so unusual for heat sublimation users to create varieties of special products to satisfy their customers’ diverse needs. Whether it’s providing full-color plaques, interior signage or promotional goods, a single vector logo provided to a digital decorator can produce thousands of separately customized, sublimation products. Selection of sublimation ink for professional quality sublimation applications can be quite critical. High-quality sublimation ink with a premium-quality sublimation printer is important for users to print a more precise effect for best outcomes. At times I have seen many users complaining about sublimation ink not working efficiently; some either because of the nozzle of ink block or because of bad ink quality, due to which they fail to acquire satisfactory print effect. For beginners, it can be more difficult to choose the right ink as there are hundreds of sublimation ink products available in the market. However, if you consider, the factors given below when going for the buy, you might be able to choose the most appropriate and best one. Sublimation ink with larger particles can cause printer plug phenomenon, and the product image created in the production won’t be delicate enough. If the ink particle is too big, first it will possibly block the printing head. Second, the transfer and printing result won’t be fine and smooth. The granular could be easily seen under a magnifying glass. The smaller the sublimation ink particles, the better the quality of the print. If you need finer and high-quality image, always go for the ink with tiniest particles. Sublimation ink is transferred to the product mainly through the sublimation characteristics of the graphics or image, so the ink or color reduction rate is very important. The general reduction rate of an imported ink can reach as high as 90%, generally after the transfer of heat transfer paper on the graphics is near to the white. So the saturation of the image is excellent, and the color is comparatively bright. A good sublimation ink must have a high reduction rate. The color of the ink must be in its purest form. One big problem with many sublimation inks is that the black color doesn’t appear to be black enough. Some poor quality black color inks often look like a mixture of some red and purple. If the color of the ink is not pure it could never restore the original image to your substrate. As black color is the easiest to cast, you can check the purity of the ink color by heat printing using the black ink. If it appears good, you can go for the ink. Water-based sublimation ink is used by the majority of the users. Some users often complain that their sublimation paper takes too much time to dry after printing. Many think that their transfer paper is the problem. However, the drying time also depends on the sublimation ink. In most low-end inks, the major component is water, and not the sublimation dye, which means water, is literally being printed to the paper rather than the dye, due to which the paper dries very slowly. Always check the ratio of the solvent and the dye of the sublimation ink. Make sure that it has an appropriate ratio of water and dye. Many high-end inkjet printers are compatible only with the ink manufactured by their own brand. Also, some ink may not work with the particular printer model that you have. It’s no use purchasing a product that can’t be used. So before going for the buy check the ink instructions mentioned in the manual of your printing device and choose the sublimation ink accordingly. You must always consider the price when choosing sublimation ink. Good sublimation ink is available between the price range of $20 and $100 or more. For sublimation ink, the higher the price, the better is the quality. If you have a low budget and require high production, however, can compromise with the quality then go for the ink with cheaper price. But if the quality of the print is your priority and you can invest a higher amount of money then it’s best to go for the high-end products. These Inkjet Brand, four bottles of UV resistant Sublimation Ink are particularly formulated for Epson inkjet printer series. These will offer premium printing quality with bright and vivid colors. The ink can be used for refilling refillable ink cartridges and Continuous Ink Supply System, for thermal transfer. Four different colors; black, Cyan, Magenta and yellow are included. 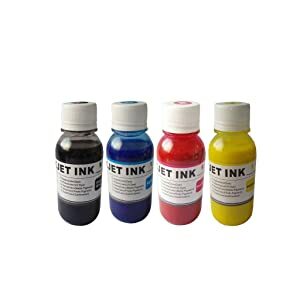 Each bottle has sublimation pigment ink of 100 ml, which can be used to refill ink cartridges a number of times. The ink is affordable and will deliver quality print comparable to that of the high-end sublimation inks. I have seen many sublimation ink buyers make some mistake in choosing their ink, only to regret later. We must learn from the mistakes committed by others and try to avoid making the same mistakes. This way you’ll not only save your money but also you’ll be totally satisfied with the choice you have made. Here are some of the common mistakes made by many buyers. Some buyers forget to check their printer model and end up buying the sublimation ink that can’t be used with their device. Also, some inks are formulated only for certain printers, so if there is no ink recommendation for your printer model, make sure that the ink you buy is rated universal. A bad quality ink not only ruins your printing project but there is also a higher chance of causing damage to your printer itself. Many buyers buy cheap quality inks intended to save some money and end up with a damaged printer. So be careful while choosing the quality. For novices, it may be difficult to distinguish between the different types of inks and by mistake purchase the ink that can’t be used for heat printing. Normal printer inks and sublimation inks are two different things. Make sure that you purchase the right type. Some buyers are in so much hurry that they ignore the need to test the color by taking a print-out at least once, using the ink sample, only to be disappointed by the color of print when they actually start using it. I would advise you to always test the color before buying the ink. Choosing the right ink among so many choices can be difficult and time-consuming, especially if it’s your first buy. If you are into sublimation printing, follow the above tips while purchasing your sublimation ink. I’m very much sure that you’ll be able to find the best sublimation ink in your budget by considering the mentioned factors. Take your time and select the best that you can get.